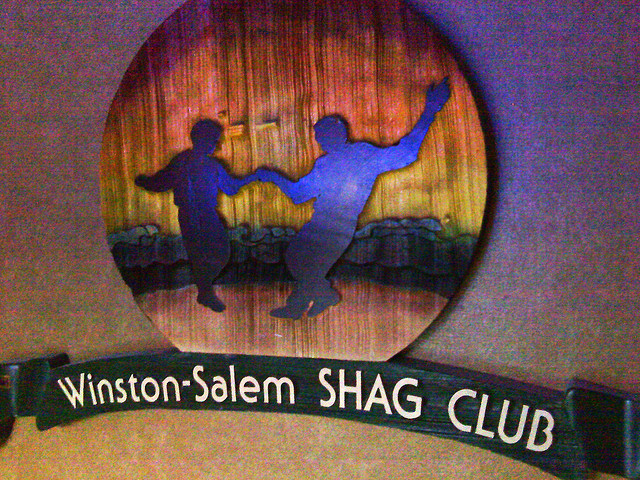 Shag Club sign in North Carolina; photo by Prehensile Eye on Flickr (noncommercial use permitted with attribution / share alike). North Carolina designated the shag as the official state popular dance in 2005 (clogging was also named at this time as the state folk dance). The Shag is a type of swing dance that developed during the 1930's and 40's combining nimble footwork with upbeat rhythm and blues (known as beach music). Shagging originated at open-air beach parties on the North and South Carolina coasts. South Carolina also recognizes the shag as a state symbol. The Carolina Shag is a form of swing dance, or jitterbug. There are many other styles of swing dancing such as: Lindy Hop, New Yorker, Dallas Push, Houston Whip, Imperial Swing, East Coast Swing, and West Coast Swing. Swing is dancing competitions are held nationally and internationally. "The term swing dance refers to a group of dances that developed with the swing style of jazz music in the 1920's, 30's and 40's (although the earliest of these dance forms predate swing jazz music). The most well-known of these dances is the Lindy Hop, a popular partner-dance that originated in Harlem, NY. While the majority of swing dances began in African-American communities, a number of forms (Balboa, for example) developed within Anglo-American or other ethnic group communities. Jitterbug is often associated with one form of swing dance, but it is in fact a general term for all swing dances and is more appropriately used to describe a swing dancer than a specific swing dance." Carolina shag dance club on the beach; photo © Melissa J. Gilpin (MJG1984) on Flickr (all rights reserved; used by permission).